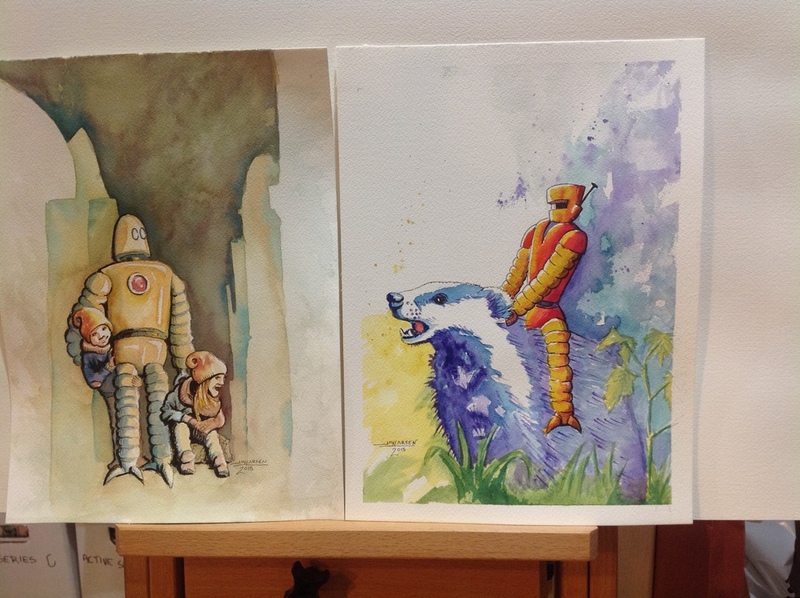 I just finished two very different Robot paintings that have some less obvious things in common. Yes, they both have Robots in them--That's obvious. No, the less obvious thing is what I am learning about motion within a painting: Motion of the paintbrush, but also the Motion of the Energy and the Motion of the Emotion of the painting. I have been discovering that my finished paintings feel more coherent and energetic if I can feel and visualize the movement before I start moving the brush. For the children on the left I visualized dust and dirt slowly drifting down to settle and aggregate, almost creating the building and the characters as if by a slow geological/sedimentary process. As I applied paint I kept feeling this slow fall and drift of the dust, slowly building up layer after layer until the canyon of buildings and the Robot appeared. The result is a very deep but static formation. Even the children, who have more energy than their environment, seem caked in the fall of dust. After all those rocky grey tones, I needed a splash of color. So I chose a black and white animal as my subject (ironic, I know!) But I picked a brighter color triad and started sketching. When I finished my sketch, I realized I had just drawn two characters sitting on their butts. Not very dynamic. So I decided to alter the sketch slightly to make it seem like they had suddenly come to a halt. Like their obvious forward motion had been checked. That gave me the idea of actually laying out the characters and my paint motion as a big checkmark: starting at the badger's nose, diagonal down to the bottom, and then up to the top-right of the paper. Laying my paint in along these lines of motion added more interest and emotional energy to the characters. I am learning so much as I work through these paintings and the puzzles they create. When I have a positive image of how the energy will move, the paintings really seem to spring to life in ways that are surprising and interesting even to me. I hope you enjoy them half as much as I enjoy the process of creating them. I will be photographing these two additions to the Robot Art series and posting prints in the very near future. Let me know what you think and keep your eyes open. Robots are Everywhere!